Roofing Contractor Fairburn: What’s Causing My Roof to Leak? When it comes to taking care of your roof, there are many things you can do to ensure that it’s always in it’s best shape and stays that way. However, there are some situations in which your roof may become damaged and start to leak. When this happens, there could be a variety of reasons and it’s best to know just how your roof’s health is affected. Our roofers have put together a list of reasons that your roof is leaking. Check it out below. If you’re not familiar with what flashing is, it’s the pieces of metal that are installed under shingles. The purpose of flashing is to create a waterproof barrier, so if your flashing is damaged at all, you aren’t getting the waterproofing you need, causing water to leak through. Believe it or not, but your gutters are an integral part of your roof and not taking care of them can cause quite a bit of issues with your roof. 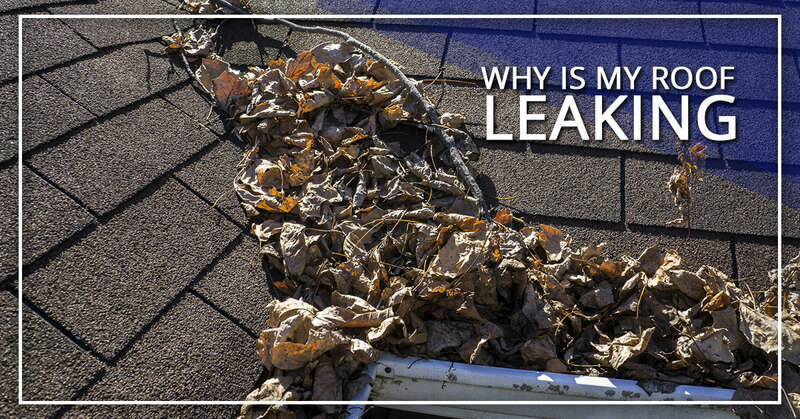 When leaves and other debris start to build up, water cannot pass through, causing it to back up and spill onto your roof. When this happens, you’ll begin to have issues with leaks. Avoiding water damage from dirty gutters is really easy, just clean your gutters and save yourself the money and headache. Vent booting is the small pipes that stick out of the top of your roof. Their purpose? To ensure that excess moisture is being expelled. If these are damaged, you’ll notice a dark spot and a bit of mustiness. Valleys are the areas where two slopes come together on your roof. Water tends to be drawn to these areas (path of least resistance) and if they’re not properly sealed, water will start to leak through. Simply stepping on these areas can actually cause them to crack, but if they weren’t sealed properly in the first place, you’ll need to contact a roofing company about what your choices are. Shingles are the very thing that are supposed to protect your roof and if they’re cracked or peeling, they won’t serve their purpose and you’ll find leaks in your home. If you’re having a hard time locating the reason for your leak, consider taking a look at your skylights. Do you notice anything? Oftentimes, skylights that weren’t properly installed will start to get dark spots around them and this is a sure sign of water damage. It could also mean that the flashing around your skylights are damaged. Either way, you’ll need an inspection. If your roof is currently leaking, or you want to make sure that it doesn’t leak in the future, call the experts at SAFG, Inc. Our roofing contractors can come take a look and determine where the damage. Our roof repair is among the best in Fairburn, so you can rest assured that we’ll find the problem and solve it for you. If we find that you simply need a roof replacement, our roofers are the guys for the job. Call us today!